It has been one week since Jay-Z released his thirteenth studio album Magna Carta Holy Grail and the first week sales projections have claimed to move 350k-400k units. This number is based in part off the pre-order sales from digital retailers such as iTunes. If the album moves this much, it will have the #1 spot, making it Hov’s 13th chart-topping debut – thus giving him the title of the solo artist with the most #1 albums in history. On top of this, the RIAA has presented Hov with a platinum plaque for 1 million copies sold of Magna Carta Holy Grail, which marks his 12th platinum album to date. Independence Day (July 4th) marked the release of the digital release of the album to all users with a Samsung device, with the official physical album release was set for July 9th. But on July 8th he surprised nearly 2.7 million Twitter followers with an improptu question and answer session which lasted nearly 6 hours. Keep in mind Jay-Z is one of the few artists who rarely uses social media platforms to voice his personal life, his Twitter page was previously just a message board for upcoming announcements accumulating to about 50 tweets. The 6 hour conversation was a real treat to the fans, which revealed some fascinating insights about the recording of MCHG. It has also enlightened Twitter feeds all over the world with some fun facts and opinions of Hov about the music industry, pop culture, influences and his everyday life. The decision to hold a public online discussion on the eve of the release date, as well his partnership with Samsung, shows his support for the digital age of music industry. Among the 150 or so Twitter conversations held, one fan asked the Brooklyn legend if there was a finished version of Dead Presidents III, a classic Jay-Z song series leaked via a DJ Green Lantern mixtape way back in 2007. He responded, giving two producers, Just Blaze and Young Guru, the go-ahead to release the full version. 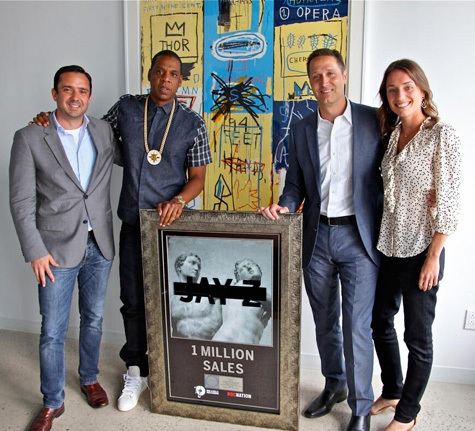 Jay-Z mentioned that he’d deliver six pieces of art following the release of Magna Carta Holy Grail. On July 10th, one of the six pieces was revealed at Pace Gallery in NYC with a live performance of Picasso Baby. The piece consists of Jay-Z repetitively rapping bits of “Picasso Baby” alongside fans and artists for a total of 6 hours. It has been reported that the video footage will be used for the music video. Judd Apatow, Wale, Jerry Saltz and Marina Abramović have stopped by and joined Jay at Pace Gallery. Get ready for 5 more ‘artworks’ to be revealed in the near future. This has been a big week for the Brooklyn rapper, but before he claimed his Platinum Plauqe for MCHG, Jay-Z made his debut on Power 105.1’s The Breakfast Club. Hov chopped it up for an hour touching on everything from his love for the Cowboys to the pressures of the past at Roc-A-Fella Records. Jigga even talked about his old partner Dame Dash and even discussed the time he almost signed Lil Wayne. If you wanted to know something about Jay-Z, it’s probably covered in this interview. From J. Cole and Kanye West to Jay-Z, there is such a high level of publicity surrounding the RocNation camp in the past couple months, this might just be the start of things to come.